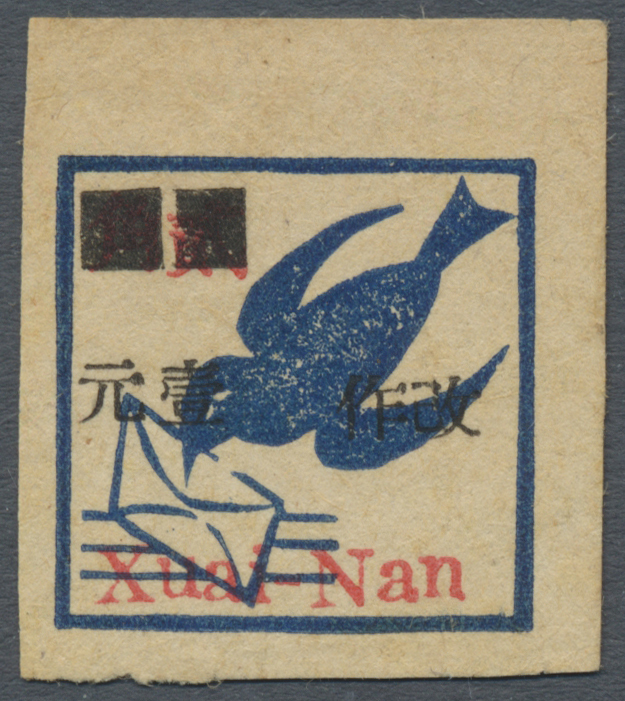 5125 ungebraucht ohne Gummi (unused without gum) (*) East China, Shandong Area, 1948, "Stamps of Shandong Liberated Area ovpt. 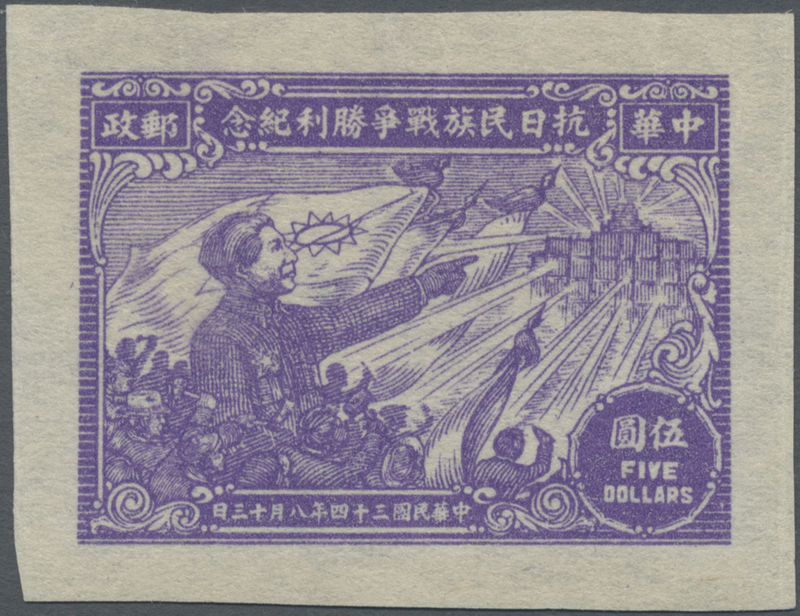 new value", on Martyrs Monument and Mao Zedong issue: $300/$1 - $3.000/$50, cpl. 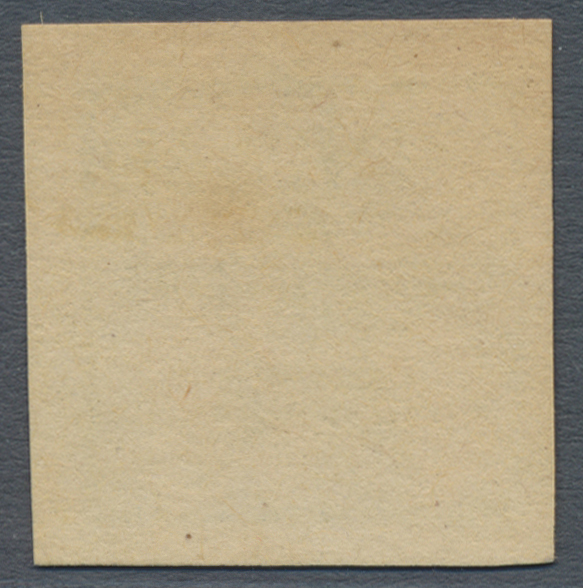 set of 8 additional $500/$20, $1.000/$20, $3.000/$50 red surcharge, $800/$10 imperf. 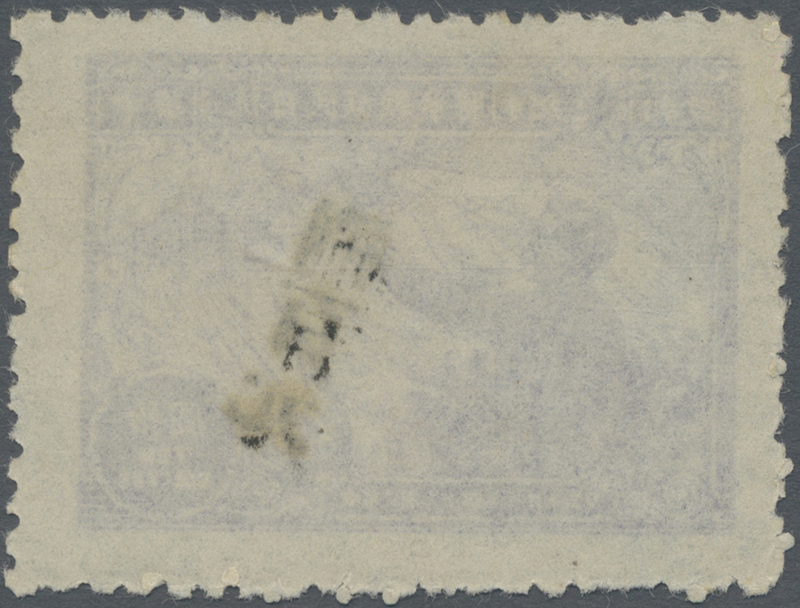 (both types), unused no gum as issued, total 16 copies, F-VF, (Yang EC137–145, EC139a, EC140a-b, EC145a). 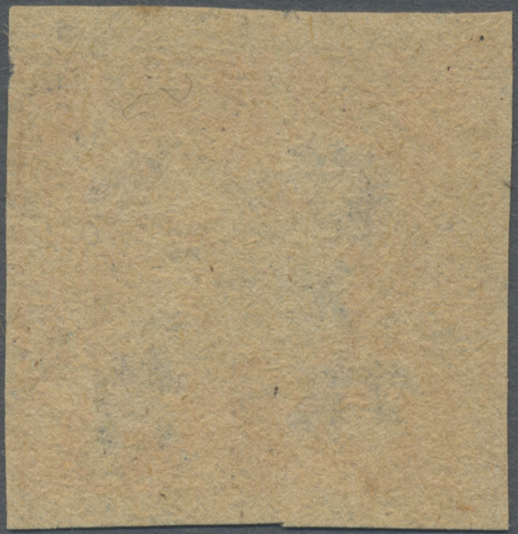 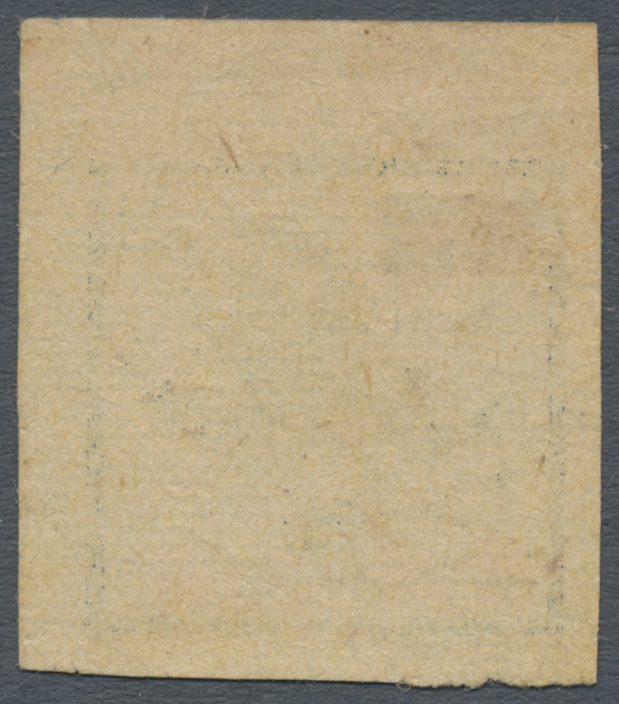 5126 ungebraucht ohne Gummi (unused without gum) (*) gestempelt (marked) East China, Shandong Area, 1948, "Mao Zedong Issue of Shandong Posts", $50 - $10.000, cpl. 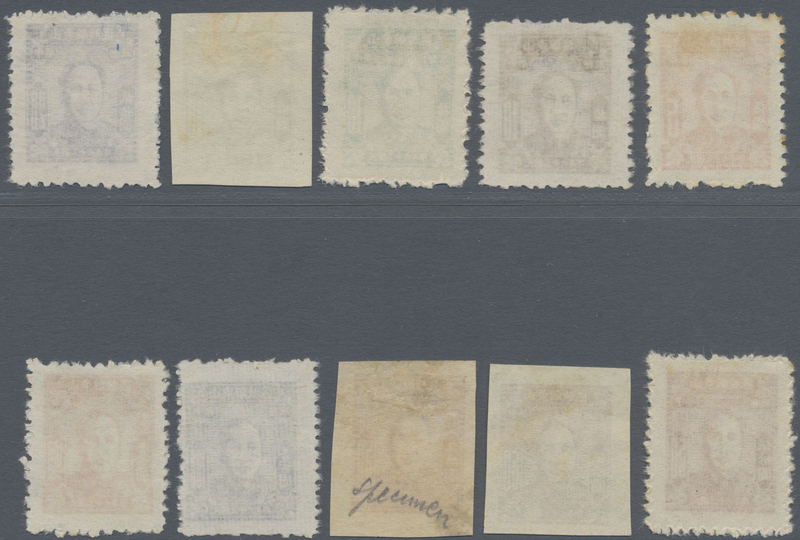 set of 9 additional $50 horizontal imperf., $500, unused no gum as issued / used, total 17 copies, F-VF, (Yang EC146-154, EC146b). 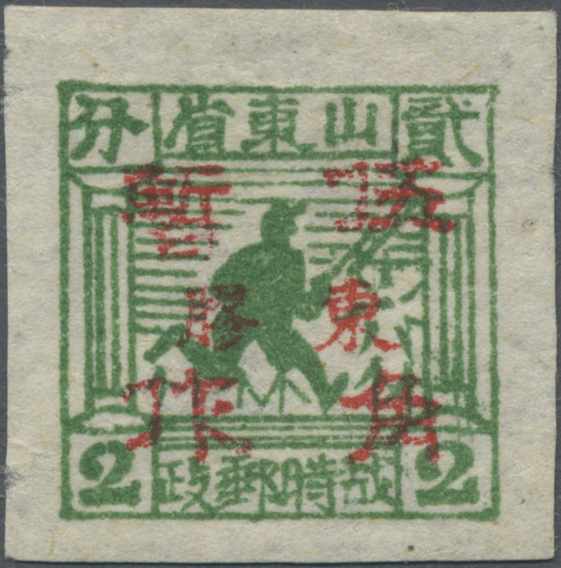 5127 ungebraucht ohne Gummi (unused without gum) (*) East China, Jiaodong District, 1942, "2nd Print Square Stamps of Shandong Wartime Posts ovpt. 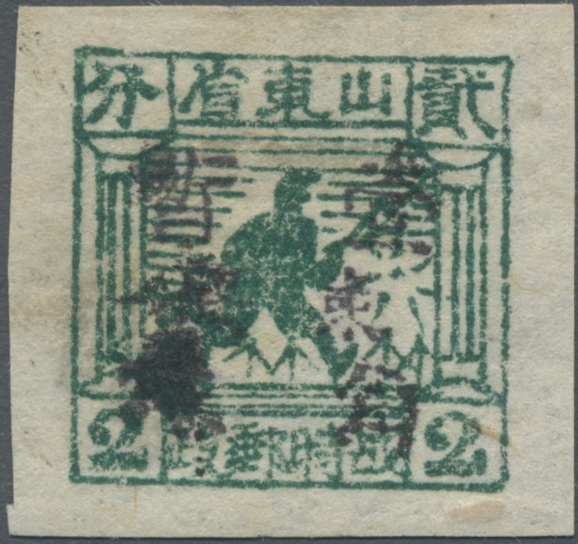 Jiaodong", 1c, 2c, hand overprint in black, unused no gum as issued, fine to very fine (Yang EC156, EC157). 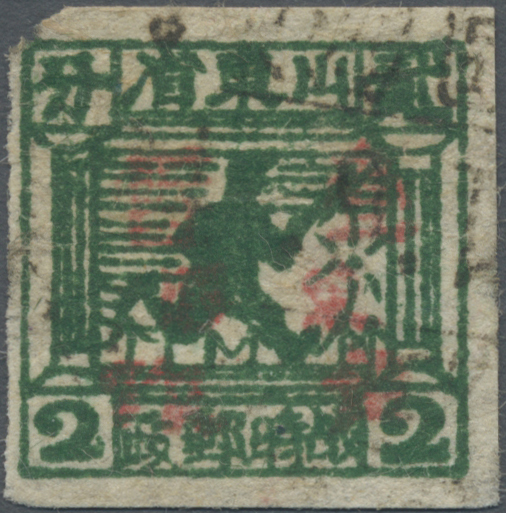 5128 ungebraucht ohne Gummi (unused without gum) (*) East China, Jiaodong District, 1942, "2nd Print Square Stamps of Shandong Wartime Posts ovpt. 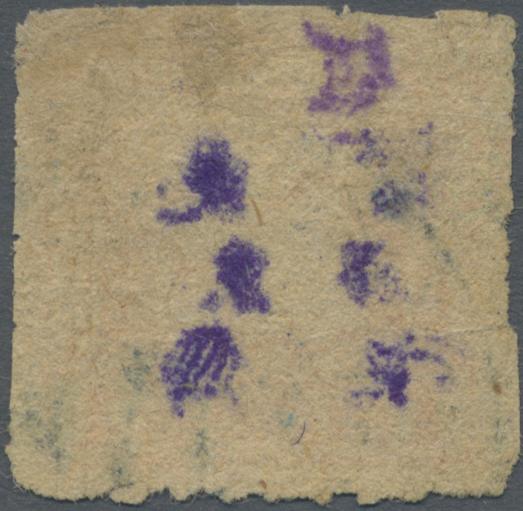 Jiaodong", 1c, 2c, hand overprint in violet, unused no gum as issued, fine to very fine (Yang EC156d, EC157b). 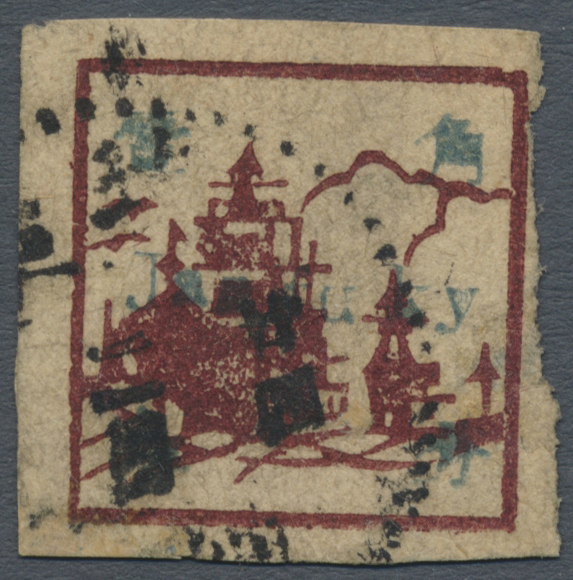 5129 ungebraucht ohne Gummi (unused without gum) (*) East China, Jiaodong District, 1942, "2nd Print Square Stamps of Shandong Wartime Posts ovpt. 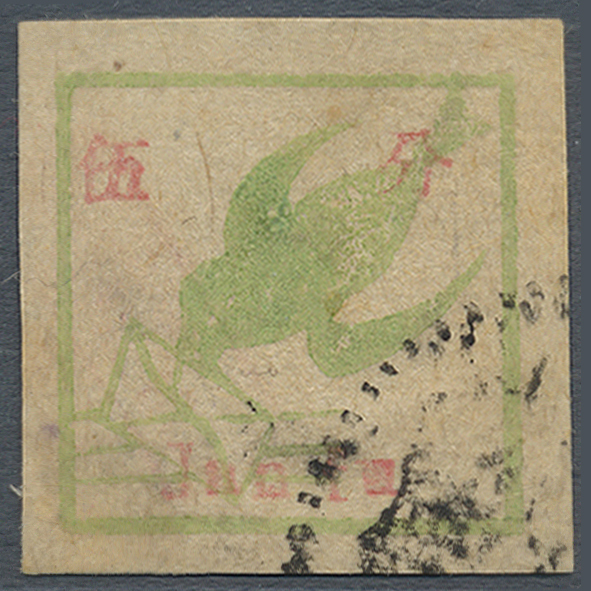 Jiaodong", 1c, 2c, 5c, hand overprint in red, unused no gum as issued, 1c horizontal crease otherwise very fine (Yang EC156b, EC157a, EC158b). 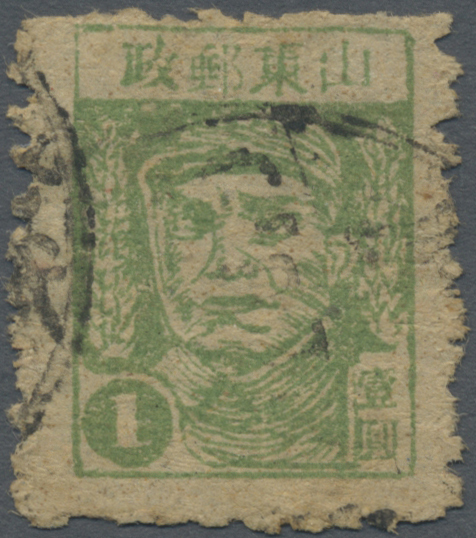 5130 ungebraucht ohne Gummi (unused without gum) (*) East China, Jiaodong District, 1942, "2nd Print Square Stamps of Shandong Wartime Posts ovpt. 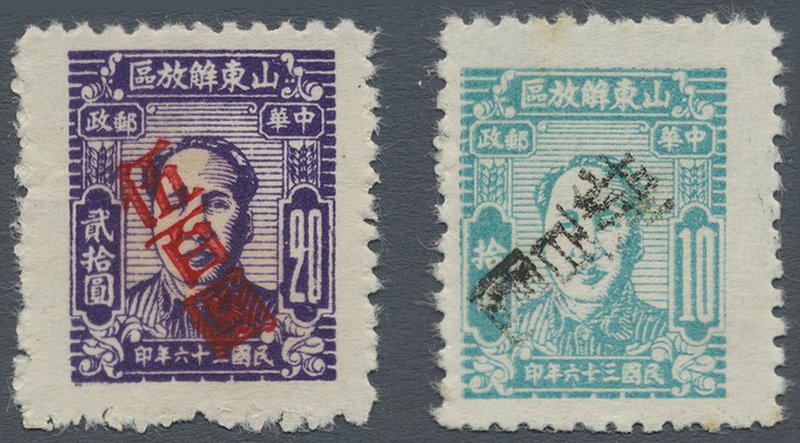 Jiaodong", 5c, machine overprint in red, 3 copies (distance between “? 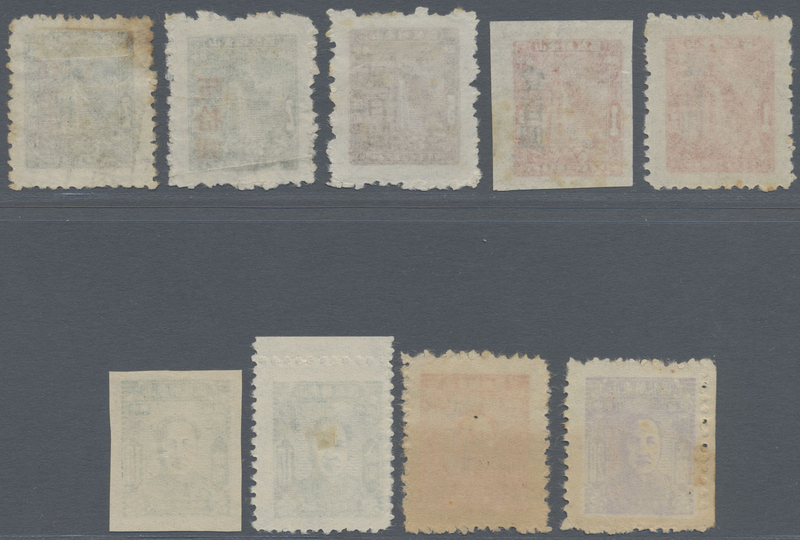 ?” 4.5, 5.5 and 6.5mm), unused no gum as issued, very fine, rare assembly (Yang EC158c). 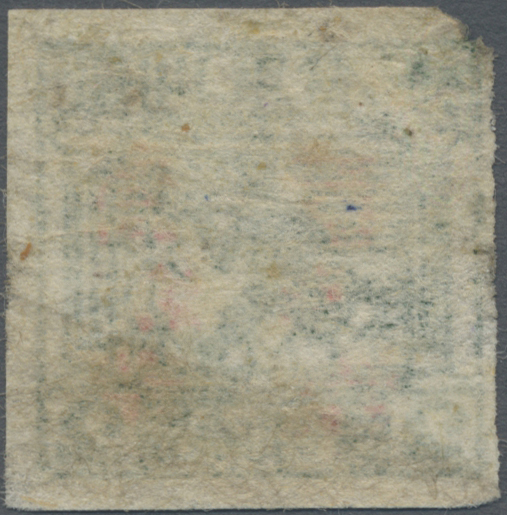 5131 ungebraucht ohne Gummi (unused without gum) (*) East China, Jiaodong District, 1943, "2nd Print Square Stamps of Shandong Wartime Posts ovpt. 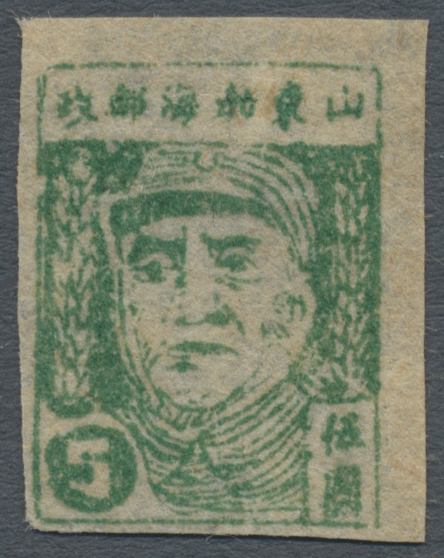 Jiaodong", 5c/1c, hand overprint in blue, unused no gum as issued, very fine (Yang EC162a). 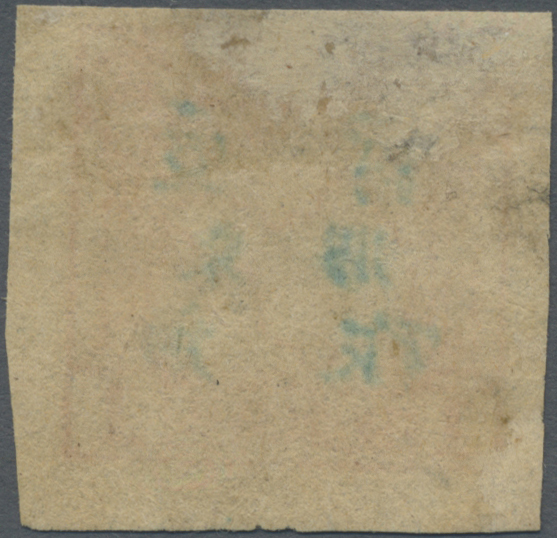 5132 ungebraucht ohne Gummi (unused without gum) (*) East China, Jiaodong District, 1943, "2nd Print Square Stamps of Shandong Wartime Posts ovpt. 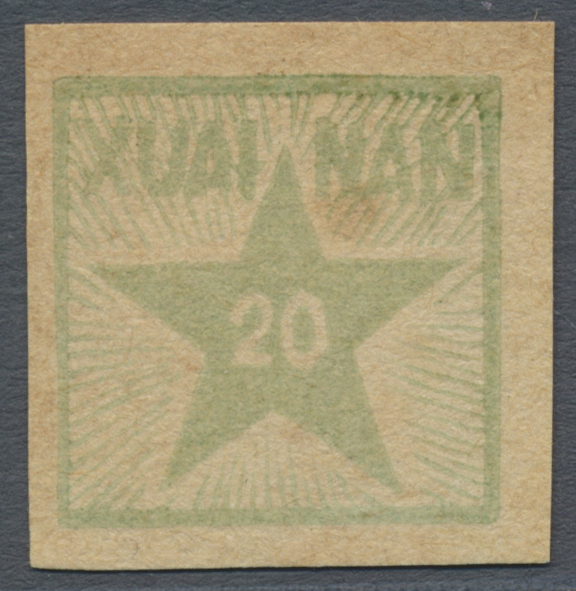 Jiaodong", 10c/1c, hand overprint in black, unused no gum as issued, fine (Yang EC163). 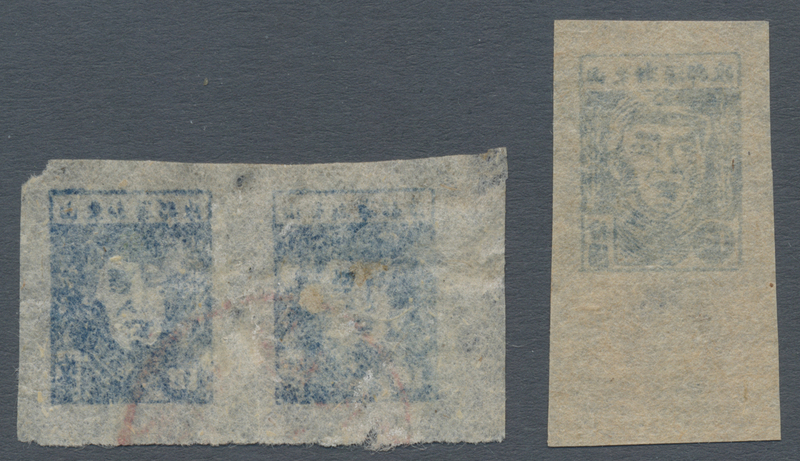 5133 gestempelt (marked) East China, Jiaodong District, 1943, "2nd Print Square Stamps of Shandong Wartime Posts ovpt. 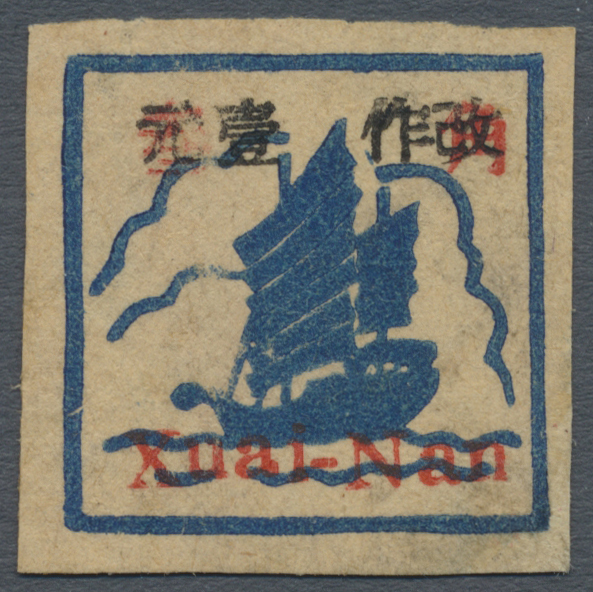 Jiaodong", 10c/1c, hand overprint in blue, used, upper left corner backed with paper (Yang EC163a). 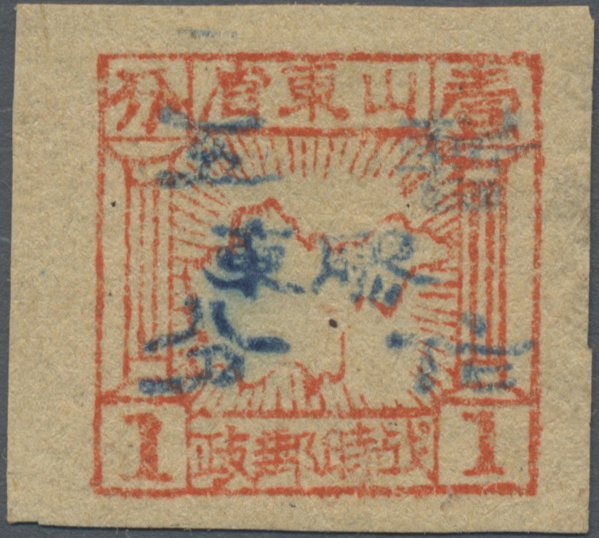 5134 gestempelt (marked) East China, Jiaodong District, 1943, "2nd Print Square Stamps of Shandong Wartime Posts ovpt. 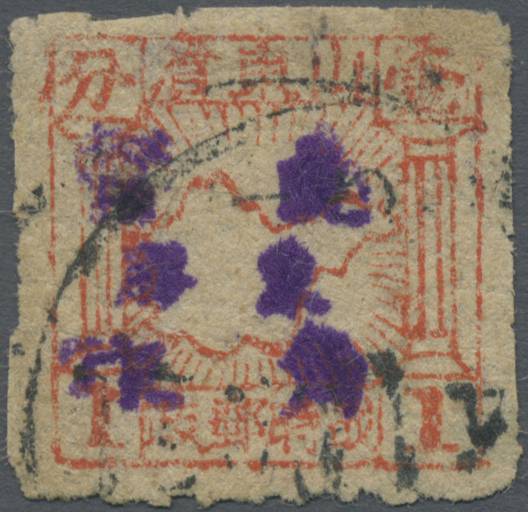 Jiaodong", 10c/1c, hand overprint in violet, used, fine (Yang EC163b). 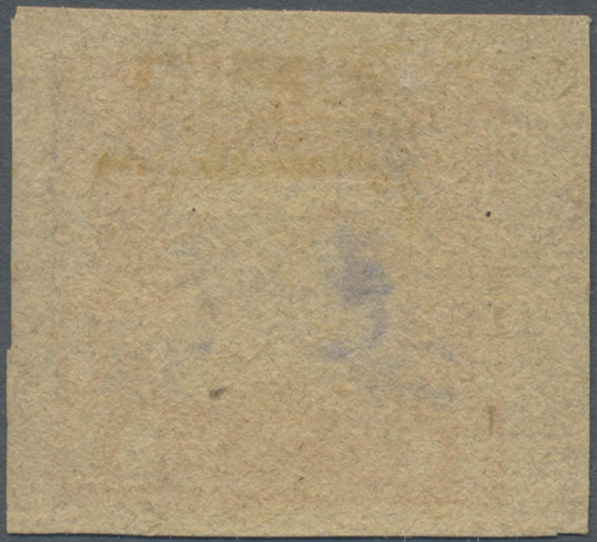 5135 ungebraucht ohne Gummi (unused without gum) (*) East China, Jiaodong District, 1943, "2nd Print Square Stamps of Shandong Wartime Posts ovpt. 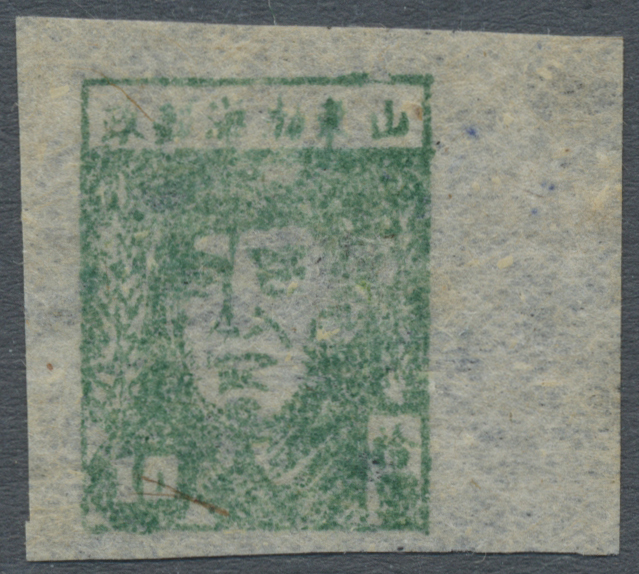 Jiaodong", 10c/2c, hand overprint in black, unused no gum as issued, hinge remnant, fine (Yang EC164). 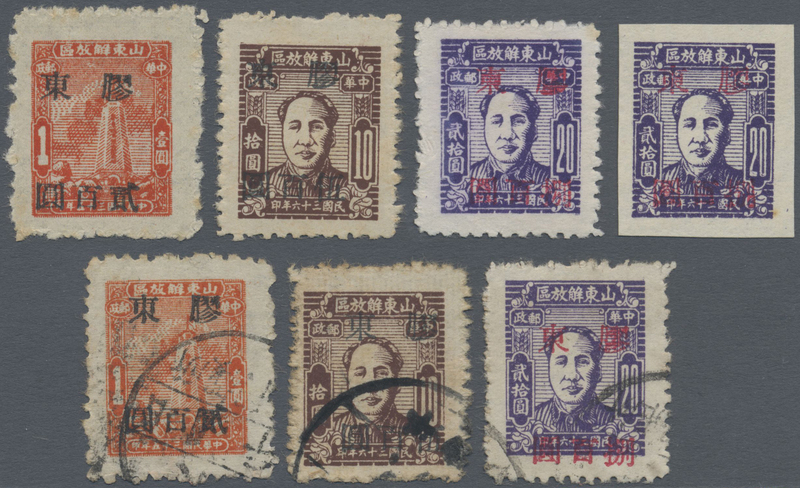 5136 gestempelt (marked) East China, Jiaodong District, 1943, "2nd Print Square Stamps of Shandong Wartime Posts ovpt. 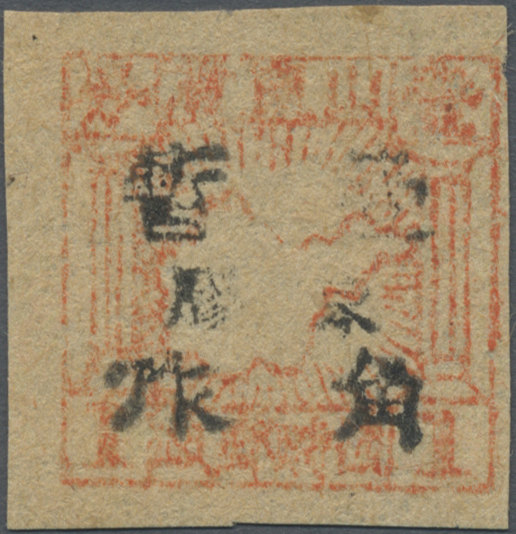 Jiaodong", 10c/2c, hand overprint in red, used, fine (Yang EC164b). 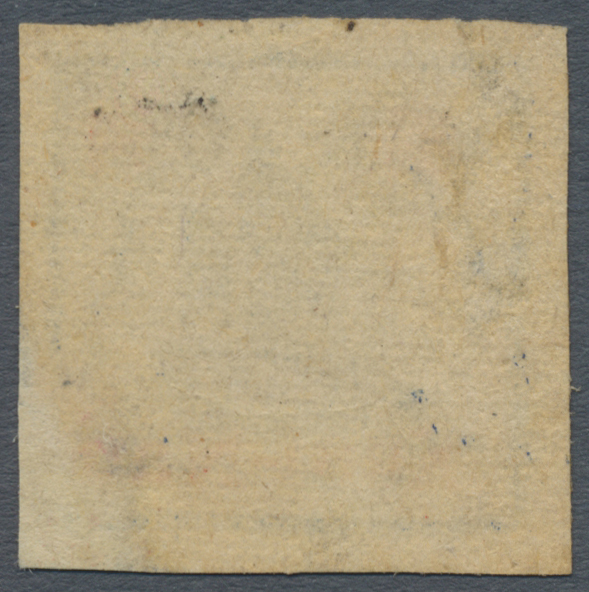 5137 ungebraucht ohne Gummi (unused without gum) (*) East China, Jiaodong District, 1943, "2nd Print Square Stamps of Shandong Wartime Posts ovpt. 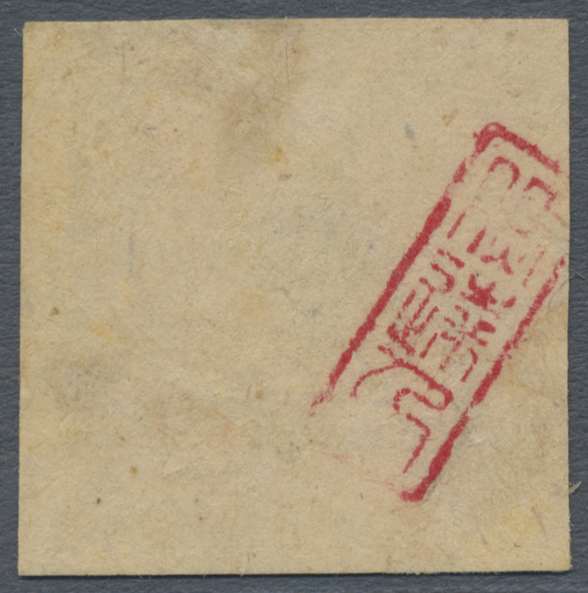 Jiaodong", 50c/2c, hand overprint in red, unused no gum as issued, very fine (Yang EC165). 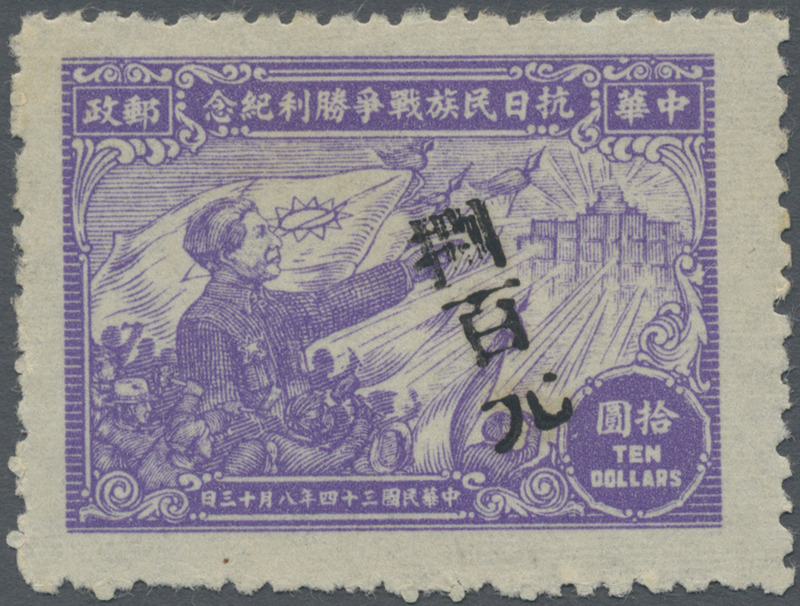 5138 ungebraucht ohne Gummi (unused without gum) (*) gestempelt (marked) East China, Jiaodong District, 1948, "Stamps of Shandong Liberated Area ovpt. 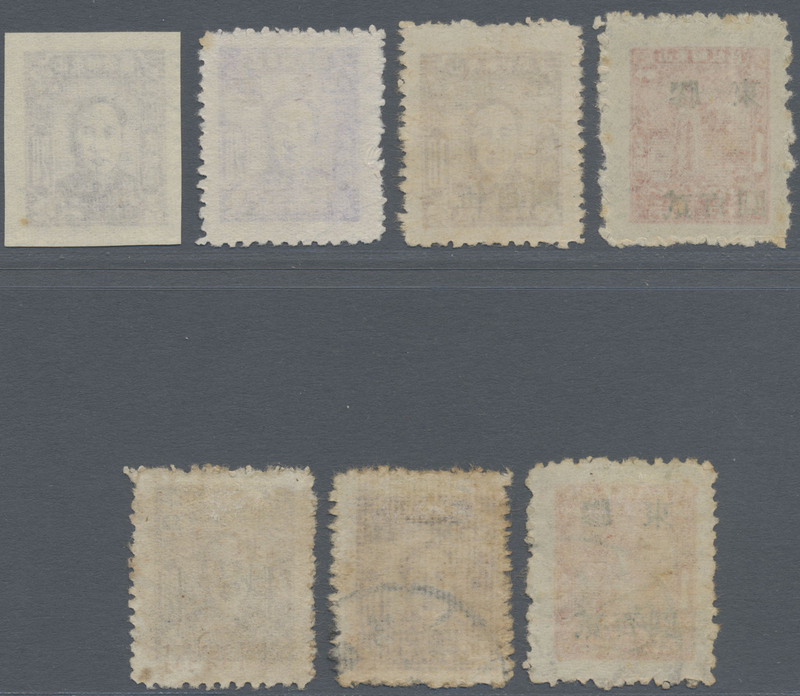 Jiaodong", on Martyrs Monument and Mao Zedong issue: $200/$1, $500/$10, $800/$20, unused no gum as issued / used, small faults, total 7 copies, F-VF, (Yang EC174-176). 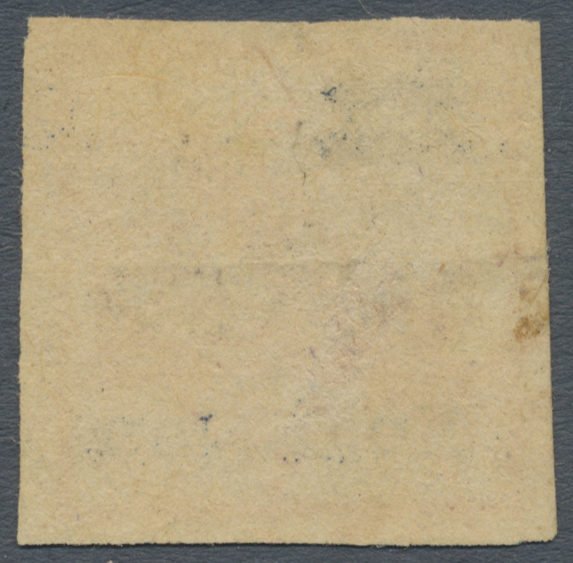 5139 ungebraucht ohne Gummi (unused without gum) (*) East China, Bohai District, 1946, "Zhu De Issue of Bohai Posts", $5, unused no gum as issued, as is, F-VF, (Yang EC178). 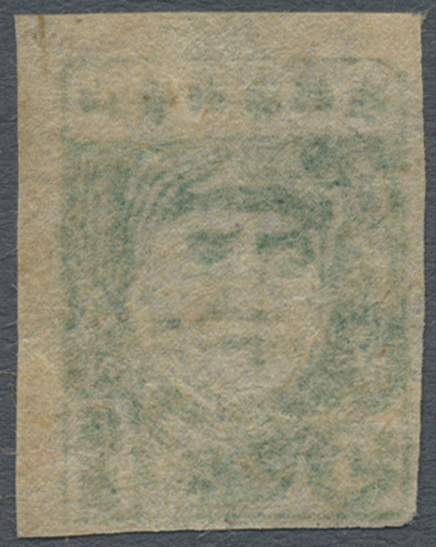 5140 ungebraucht ohne Gummi (unused without gum) (*) East China, Bohai District, 1946, "Zhu De Issue of Bohai Posts", $10 (green), unused no gum as issued, VF, (Yang EC179). 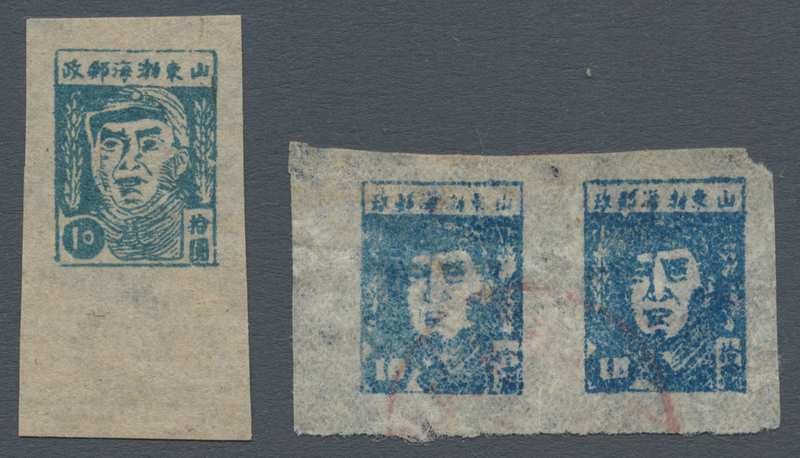 5141 ungebraucht ohne Gummi (unused without gum) (*) gestempelt (marked) East China, Bohai District, 1946, "Zhu De Issue of Bohai Posts", $10 (blue, both types), 2 copies (one pair), used (pair, square type), unused no gum as issued (round type), F-VF, beautiful used pair, rare (Yang EC180, EC180a). 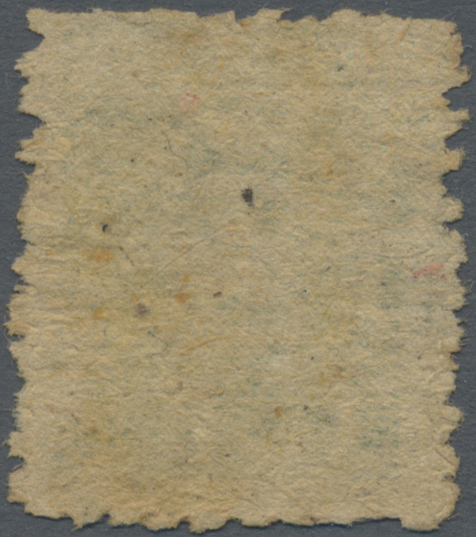 5142 ungebraucht ohne Gummi (unused without gum) (*) East China, Bohai District, 1946, "Mao Zedong Issue of Bohai Posts", $5 - $10, cpl. 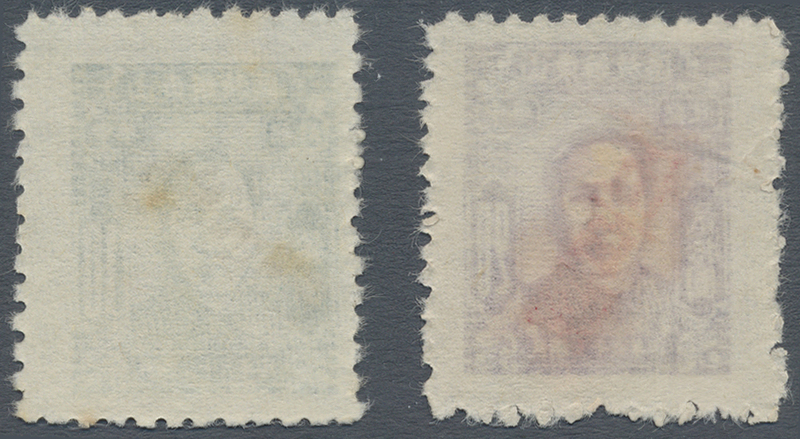 set of 2, unused no gum as issued, F-VF, (Yang EC181-182). 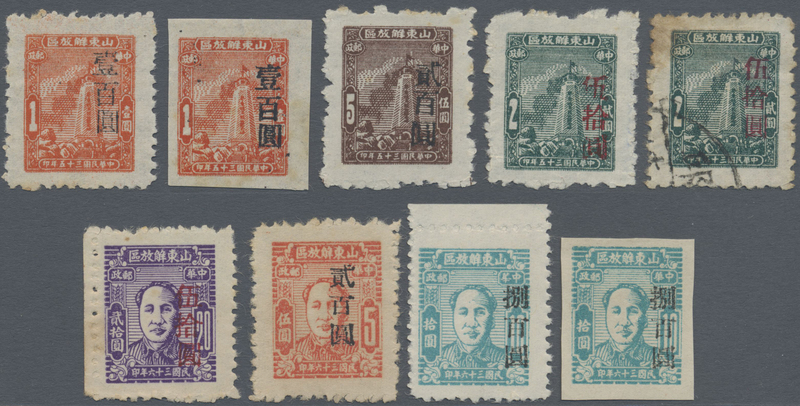 5146 ungebraucht ohne Gummi (unused without gum) (*) East China, Huainan Area, 1943, "Stamps with Denominations ovpt. 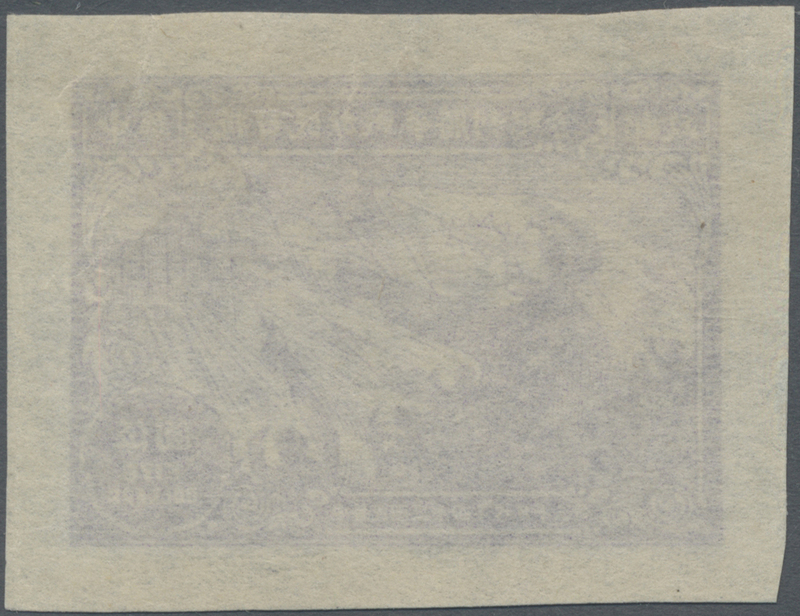 with new value", $1/30c, unused no gum as issued, pos. 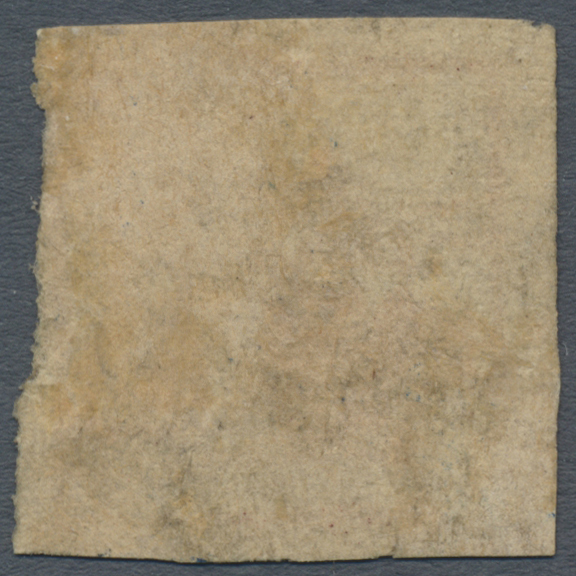 7 in sheet of 9, small tear and thin upper left, slightly rubbed otherwise fine (Yang EC221). 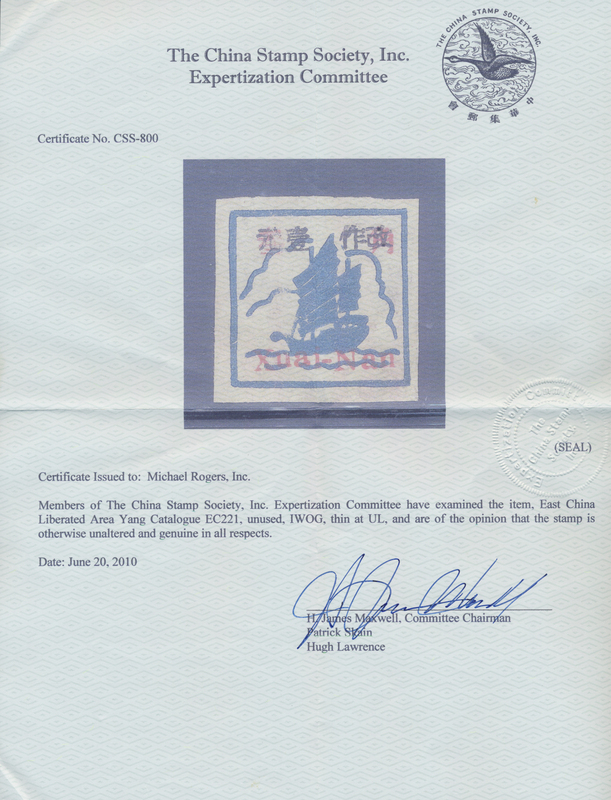 CSS certificate CSS-800 . 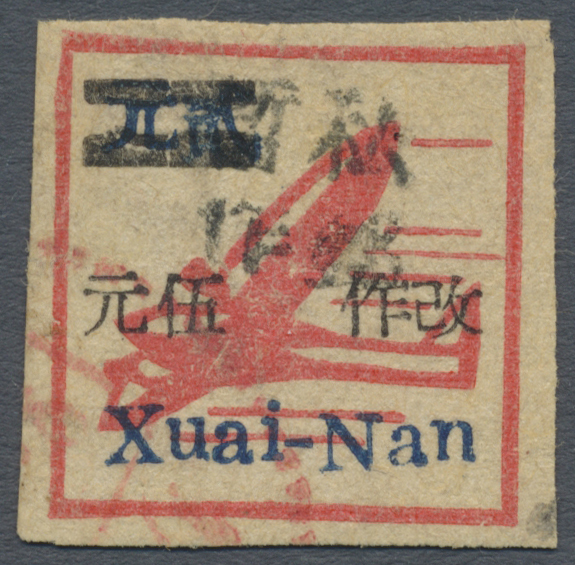 5147 gestempelt (marked) East China, Huainan Area, 1944, "Stamps ovpt. 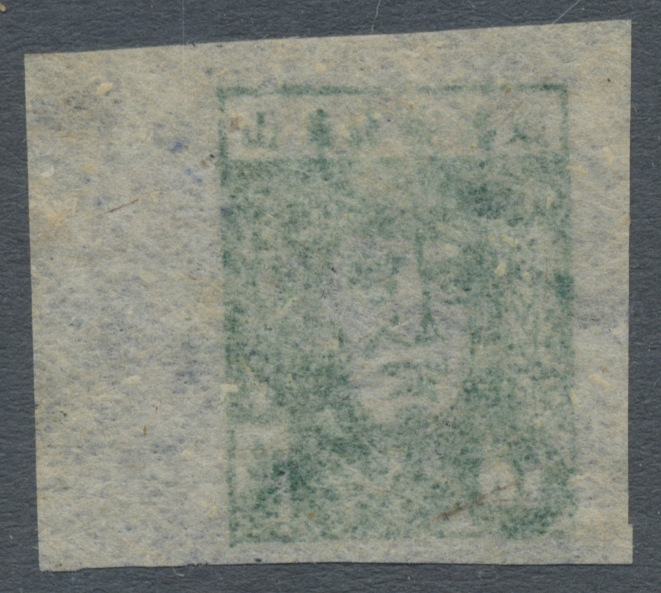 Temporarily Used for Personal Mail", $5/$2, used, small thin otherwise fine (Yang EC229). 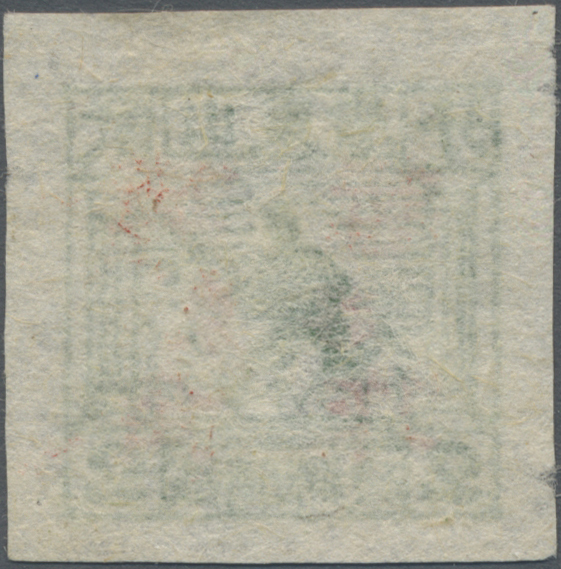 5148 gestempelt (marked) East China, Yanfu Area, 1944, "1st Issue with Denominations", 15c, used, Pos. 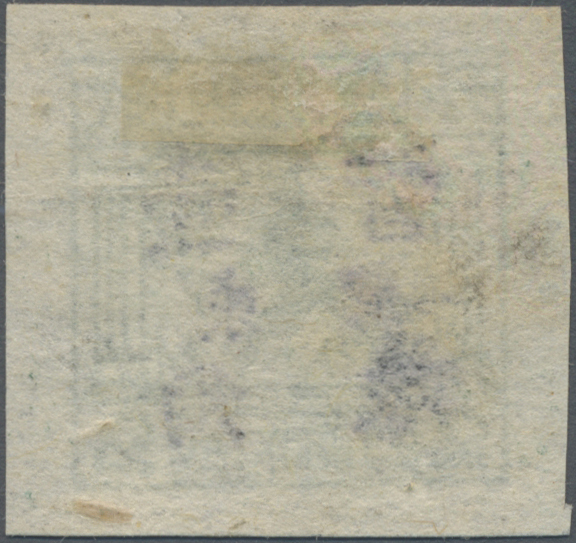 7 in sheet of 9, VF (Yang EC235). 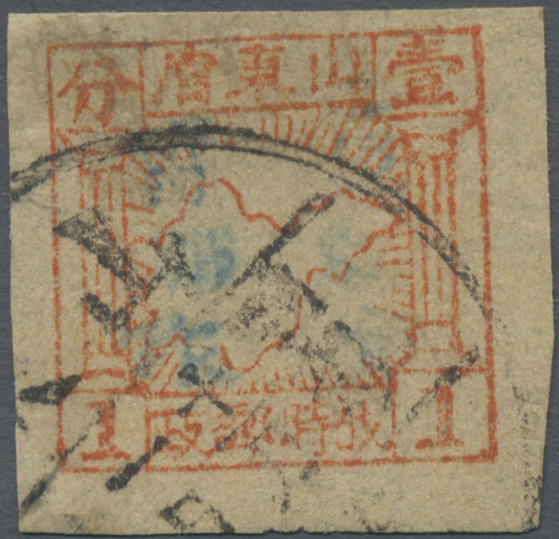 5149 gestempelt (marked) East China, Yanfu Area, 1944, "2nd Issue with Denominations", 5c, used, F-VF (Yang EC237a), red seal on reverse.